Published August 28, 2014 By Anna T. This post may contain affiliate links. Regardless, I only recommend sites I've researched and/or used and trust. I often review various websites that pay you to write. These have mostly been content sites/mills that have regular assignments available that you can grab and work on at your leisure. Most of those sites don't pay all that well, although they are good to have access to for when you need money in a pinch. Today, I thought it might be fun to make a list of blogs that pay you for guest posts! As you know, most sites do not pay you for guest posting. Your reward is usually considered the byline at the end where you can promote your own site or services. But there are some sites that not only pay for guest posts, they pay pretty well for guest posts. 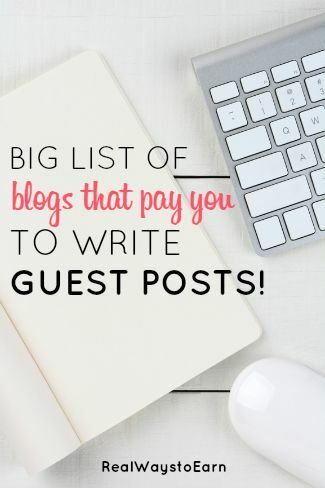 Even though guest posts are usually either one-time or very occasional writing opps, they are great for getting your name out there and boosting the rank of your blog or website if you have one. Also, there's no guarantee that the following sites will accept your submissions. If they don't, try not to get discouraged — you can always submit your work someplace else. Some of the sites below will allow you to have a byline and some won't. ACHS – Submit a blog post of 600-1000 words plus at least three photos on your favorite topic related to holistic health and wellness. Compensation is $50 if your post is published. BootsnAll – Pays up to $50 for indie travel articles. Cracked – Always open to guest post submissions on TV, movies, music, video games, etc. Compensation amount not listed. Dollar Stretcher – Frugal living site that will pay for some guest posts. This site will not give you a byline linking back to your own site if you are paid. Dropzone – Sky diving articles. It appears they pay, but the compensation rate isn't listed. Elite Personal Finance – Claims to pay between $30 and $100 for personal finance articles. Listverse – This site pays $100 for great lists. I have actually reviewed them here. Read. Learn. Write – Pays $50 a post for personal experiences with reading, learning, and writing. Your Online Biz – Currently offering $100 for quality guest posts. BlogPaws – Pays $75 for accepted contributions. I'd love to keep adding sites to this list! If you know of any other blogs or websites that are currently paying for guest posts, please let me know and I'll try to get those added. Want To Take Things a Step Further And Go Into Business as a Freelance Writer? There is potential to earn MUCH more money this way. You can get your own clients and set your own rates, which you cannot really do with the sites/blogs listed above. A six-figure income is not outside the realm of possibility when you're running your own business. Gina also wrote up an incredibly detailed guide on working for yourself as a freelance writer if you're interested in getting a lot more information on how to go about it. Hi, I know this post is old, but for anyone reading it now, BlogPaws.com also takes submissions for paid posts. I don’t know how much they pay, and they are a little picky, but it is also a great place to get your name out there. Most of their posts are about blogging and having a successful online presence. The site is geared towards people who write animal blogs. A very informative post indeed! Most of us know only about those guest blogging sites who accept your post in turn of either a valid link or getting exposure to a larger audience base. It’s really great to know about these guest blogging sites who pays some great bucks for your content. So you get the chance to promote your side while earning some real good money. Thanks for the shout out Ana keep up the good work! Yay! Thank you so much! Great resources! Randy, People working for peanuts is in just about ever line of work. Look at Virtual Bee, Humanatics, Amazon Mturk, and all these crowd sourcing jobs popping up all over the place all the sudden. They pay people pennies to get their jobs done and many keep buying into it because making something is better than making nothing at all. It’s slave wages but if one can’t find anything else they take what they can get. It’s sad because if we all as a whole just stopped working for these companies they would have to raise their pay but unfortunately that will never happen. Never say never, but I see your point. Many in today’s economy must take what they can get, especially if they are living in underdeveloped country. Some of the jobs that do not pay well do not require a lot of knowledge and/or skill. That is no excuse, but it is opportunity for those with limited opportunity. I just really do not see the point in wasting my time on any of those “jobs” because the pay would not even cover the internet bill. The 2 biggest problems I have is the requirement to be a U.S. citizen, but they skirt the minimum wage laws. The second problem I have is that I spent good money getting a formal education and they insult me with less than migrant worker wages. They want professional writers at the price of sweat shop labor. I could panhandle on the streets and make more money. In most cases I am finding it better to post my content to my websites for SEO. The payout is not immediate, but it will pay off in the long run. The more great content I have, the better off I will be. Anna’s blog is a great example of this approach. You can Google my name or business name and see the ground I have been gaining. Basictech Information Services, Randy Baith. Great information as always Anna, now I know the reason for the scammer trying to get people to write top ten lists. He has no intention of paying. He says he pays via PayPal every 2 weeks, but wants you to commit to writing at least ten per week. How many will you write before you realize he is not going to pay you? Just Google Kino Krash Scam and you can read about it on my blog. He may be using another name by now, I saw an ad similar to his just the other day. I am looking for the day when people will stop writing for pennies. It really disturbs me how these paid article and freelance sites want great quality writing and are paying peanuts. Why are people selling themselves short? To be a professional writer takes skill and hard work. I think it is a slap in the face to write a quality article of 500 to 1000 words for less than 2 bucks. Stop doing that people! !